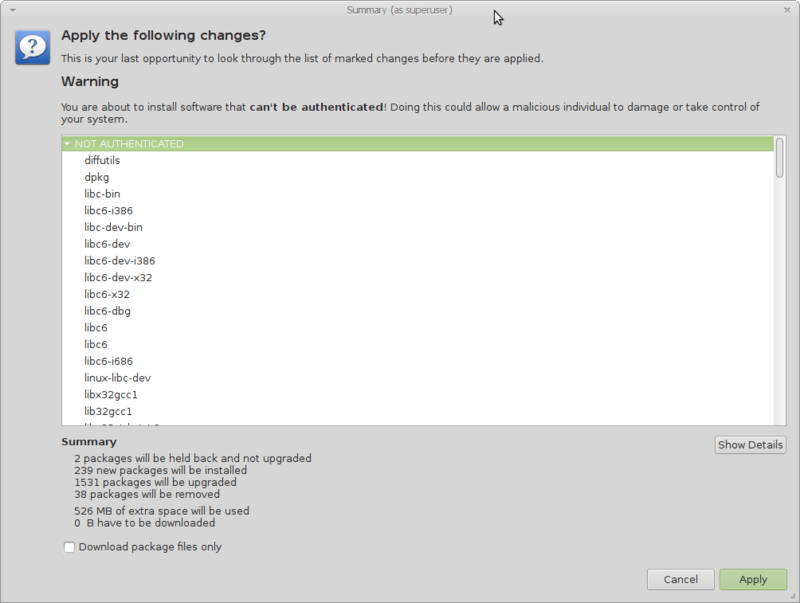 Previous Previous post: Linux Mint 16 “Petra” Xfce released! Hi, where is the change list to up8? We made specific improvements to MintSources, MDM and live-installer (which will be featured in the upcoming ISOs) but the two big changes are an updated UP based on Debian Testing (more recent stack) as well as a backport of almost everything that made it to Linux Mint 16 Petra (latest Mint tools, system improvements, a more recent MATE 1.6, Cinnamon 2.0. these are detailed at http://www.linuxmint.com/rel_petra_cinnamon_whatsnew.php and http://www.linuxmint.com/rel_petra_mate_whatsnew.php). And “Regional Settings” doesn’t change a thing. Cool! I didn’t know this released today. I was just in the middle of trying to fix an issue and ran ‘sudo apt-get upgrade’ and surprise, surprise. Of course the Repos went down right in the middle of it, but I recovered nicely enough! Edit by Clem: Hi Chris, we noticed it and you might have seen a blog post about it here. The downtime only lasted a few minutes and some Yahoo servers were down as well. We think it was a routing incident somewhere in the US. I was waiting eagerly for this LMDE update. BTW, when we’re going to have the ISO? It’d be great to have a ChangeLog for this update pack. Edit by Clem: We’ve been working on the ISOs for a little while already. I’m hoping we’ll hit QA this week. No problems afterwards so far. Updated without any issues. Fantastic job. After some updates this morning, and a subsequent reboot, my system wont fully go into Mate desktop.Everything was fine until the update this morning. Edit by Clem: Hi, please be more precise in your description of the problem. Also, install mint-meta-debian-mate to make sure you’re not missing anything. Does that mean that to Update we have to go through the Upgrade path? Edit by Clem: Hi Mike, sorry for the confusion. Update/Upgrade mean the same thing here indeed. Clem, congratulations for you great work. One thing I miss in LMDE is a file system check on boot. Sometimes I have to run a livecd in order to run fsck and correct things, when it’s not possible to log in as root to do so. I’ve been using LMDE Mate 64bit version for a couple of months, starting with the 201303 live disk version. The update to the previous kernel went very smooth, but the upgrade to up8 prevents the MATE (and even the console) to load. The system gets me past the new login screen, loads the desktop background image, but no menu or interface component allowing interaction with the system shows up. The computer does not respond to functional keys and keyboard shortcuts, although I can move the cursor by mouse. The cursor turns repeatedly into the busy wheel, but the condition does not change. The above happened when I upgraded my normal installation, but also when I started from a fresh install of the old live disk (201303). The system is a Samsung R560, which worked like a song under LMDE so far. I hope this can be resolved, otherwise I’m stuck with the 201303 version since the kernel update now points to up8 as well. Edit by Clem: Hi Ann, are mate-session, caja, mate-panel present in the process list after you log in? Also, can you check for errors in .xsession-errors and /var/log/syslog? Please release an updated ISO including update pack 8. I noticed when I try to upgrade via the update manager, before I begin downloading me it says that the new packages are unauthenticated. Is this normal? Edit by Clem: Hi Will, it’s something we’d like to fix so I can’t say it’s “normal” but it’s not a security issue. It’s a cosmetic one. We’re yet to find how to fix it and whether it’s a bug in mintupdate itself, in synaptic or a consequence of the snapshots we’re taking from Debian (which on their side are given a timeout). Hi, can I simply do this? By the way, what’s the difference between apt and apt-get? apt seems to be just a python script that uses apt-get. Edit by Clem: You can do a simple update & dist-upgrade and it “should” work fine. The reason we recommend a few extra steps is to make sure you make a backup, to make sure you point to mirrors which we know are up to date, and to minimize the risks of you encountering issues. But technically, yes, you can upgrade straight from APT. “apt” is a convenience script in Linux Mint which calls apt-get, aptitude, apt-cache and a few other tools to perform various tasks. You can type “apt help” to get help on it. “apt help held” for instance will tell you what “held” does: “dpkg –get-selections | grep hold”. I copied off my data, and I re-installed, applied updates, and am now installing hw specific drivers. I don’t know what happened this morning, but you can check out my forum post if you want a few more details. Edit by Clem: It looks like the update either didn’t apply cleanly (corrupted downloads I guess) or was interrupted and you weren’t fully up to date. At 18:30 London Time yesterday we noticed packages.linuxmint.com, debian.linuxmint.com and some Yahoo search servers (one could not get search results on http://www.yahoo.com for instance) were simultaneously down. It looks like there was a routing issue in some parts of the USA. Fortunately it didn’t last long. On your side that shouldn’t impact the update without telling you though, it would pop up a message saying it couldn’t download some packages. i followed the instructions. when installing libpng12-dev and/or other packages mentioned in the update pack info, i get warning about package not being authenticated or untrusted version. since i’m on a sensitive machine, i cannot afford to install packages from untrusted sources or once that are not authenticated. any suggestions? Edit by Clem: Debian would not be aware of the snapshot system we perform with LMDE. We also suspect cosmetic bugs in regards to authentication warnings in mintupdate and synaptic. I can confirm though that everything is as it’s intended to be. We’re looking into this bug and we might tighten the way these checks are performed (they’re very Debian-esque right now and we might need to adapt them a bit to how LMDE works) but there are no concerns about the packages or the repositories themselves. I updated today to Update Pack 8 and everything is solid. I’ve also been using KXStudio Repositories with LMDE & am happy to report everything is playing nicely together after today’s updates. I’ve never had a good experience updating Ubuntu, which led me to Debian in the first place. LMDE is the perfect blend for someone like me who wants stability, loves MATE Desktop & also adds things like KXStudio which in the past was a nightmare on Ubuntu based distro’s. Can I jump from an UP6 directly to UP8. My last upgrade from 6 to 7 went wrong and I had to recover with a backup. Edit by Clem: Yes, make sure to read and follow both the UP7 and UP8 sections of the upgrade notes. after update and restart the login screen does not appear, the screen was all green without any input fields. I think is would be better to install the new iso image. Edit by Clem: Hi. I can help easily with that issue if you want to connect to the IRC. I’ll try my best to give you hints from here in the meantime. First, check to see if nicknames appear on the login screen. If so, click on them or press the UP or DOWN arrows of the keyboard to select a user. If no names appear, then it could be an issue with webkit, and in this case the solution is to use the GTK greeter. To do so, switch to console with CTRL-ALT-F1, and edit /etc/mdm/mdm.conf. In the [daemon] section, specify “Greeter=/usr/lib/mdm/mdmlogin”. Save the file, kill and restart MDM, or reboot the computer. You should then be greeted with a GTK login screen. nice to have the login manager patched (no need to put username and visual improvement)and it also fixed the mint upload tool (that was broken on my system since UP7). Thank you very much to Clem and all the devlopment team for this amazing distribution !!!!! Where are the updated ISO images? When will the UP8 ISO images be available? Edit by Clem: We’re hoping to hit QA this week. Clem, what does it mean when some packages are not authenticated? Not authenticated by who and why? dbzix, did you read the UP notes before the upgrading? Monsta, sure. And there’re no any words about not authenticated packages. Answer to Clem: Hi Ann, are mate-session, caja, mate-panel present in the process list after you log in? Also, can you check for errors in .xsession-errors and /var/log/syslog? How do I access those when I don’t get an interface except in rescue mode? My command line and system interna skills are still in their infancy. I post the details message the updater returned below, maybe they provide a hint despite being localized German. E: /usr/share/initramfs-tools/hooks/plymouth failed with return 1.
update-initramfs: failed for /boot/initrd.img-3.2.0-4-amd64 with 1. I hope this gives you an idea of what might be going on. Edit by Clem: Hi, it looks like the upgrade didn’t complete properly. Try to upgrade plymouth first with “apt install plymouth”, check that the cached operations are fine with “apt install -f” and try to “apt dist-upgrade” to see if anything is left to upgrade. If you can’t get in the desktop, you can log in in console with CTRL-ALT-F1. Also don’t hesitate to connect to the IRC, people on #linuxmint-debian can help you troubleshoot/solve this situation. @dbzix: there are some words about it, you need to scroll a little to UP7 notes. @Ann Kniggendorf, you need to upgrade plymouth to work around the update-initramfs error. If you’re still having problems with that I recommend creating a thread in the forums with the full description of all your issues. @Marco: yes you can jump from UP6 to UP8, but you ABSOLUTELY need to read the Update Pack notes before the upgrade to avoid some breakages. @everyone seeing “NOT AUTHENTICATED” message: this is a cosmetic bug in apt tools. You should’ve read the Update Pack notes (see the section for UP7) before the upgrade, then you wouldn’t ask this question. but login is somewhat slower plus it shows the original wallpaper then it changes to the chosen one previously. hope that it all went fine though. Thanks Clem & everybody that worked on it, I am very happy with LMDE and pack 8 so far seems to work great! from log/on box when i enter my passwort it takes 30 seconds to load the desktop!!! i have a intel i5/3230m after the update the WLAN does not connect to the Signal anymore. it shows the available signals, but i cannot connect , f.e. to the EDUROAM here at the university, where i did finish the update. something must have gone wrong with the update. Edit by Clem: Hi, you need to install mint-mirrors. thanks for the update. It looks very nice. However i have a couple of problems i haven’t solved yet. Thank you, I have a smoothly running system with UP8 now. The misunderstanding was indeed the upgrade of plymouth, because packetmanager reported the installed version as up-to-date. I forced the upgrade from the command line and afterwards the UP8 upgrade went smooth. Thank you for your fast help. I tried a couple of distributions and LMDE is by far the best for both, having a functional system for everyday computer work and being able to learn the interna. Big thanks to you all! I don’t get it. I just upgraded the Update Pack to the latest following your blog post and everything just upgraded without any issue. But this is showing the latest update pack used is 6; how come? Upgrading open-vm-tools which has bug “cannot build kernel module on 3.11” with kernel 3.11… Fantastic! System upgrade stopped at this point, and the good thing was a system backup done by me before upgrading. Clem, please take a look on that. Thanks! @dbzix: when did you discover this bug? Was it today or, for example, a week ago? It would be also nice to post a link to the bug report. Monsta, I’ve got that with apt-listbugs during upgrade. Not sure where to find a link. @Monsta Apparently so. I’ve upgraded to the latest Update Pack through command line. Now what should I do? Another problem is, now I’ve got double packages e.g. two Startup Applications, two Bluetooth etc. What should be done for this? after the last update of mint-meta-debian-cinnamon and mint-meta-debian-core the 3d hardware graphic acceleration missing warning disappeared. How does one check that a mirror has the UP8? I will upgrade using the mirror at my local university but I want to make sure they are up to date. What should I look for? @Muntasim-Ul-Haque: nothing to do because that number is not used anywhere else. Read this thread – http://forums.linuxmint.com/viewtopic.php?f=198&t=151524 – for more info. Nothing’s critical here. @dbzix: ah, okay then. I’ll search for it and see if I can find any workarounds. My system is LMDE x64 with MATE desktop. – I see a panel in the right-up corner with button for shutdown, but it’s definitely NOT the Mate’s panel; seems like a Gnome interface. Also I can see mate-session, caja, and mate applets in processes (ps aux), but no application is loading. There are many errors with mention of libfreetype.so. but I don’t know what has written her at which time, so I can’t match upgrade-related errors. If I can help you with something more, just tell, ‘cauze I constantly checking this thread. Now I’m on backed up system with updates ready to install. Used sudo apt-get update && sudo apt-get dist-upgrade in the terminal. System rolled to update pack 8, but took about 2 hours, installing 1500 packages. Works fine, though. By the way, since my initial installation came from the 201303 ISO, I started with update pack 6, upgraded to UP7, then to UP8, so now there are three different versions of the Linux kernel installed on my computer. Is it safe to delete all but the latest one? i have completed 1 upgrade to UP8. the 2nd one has produced a ‘writing GRUB to boot device failed – continue ?’ notice. (this also occurred when i ran UP7 too – though i am not recalling what i did to resolve it then). @Roman: yes, you can do whatever you wish with these kernels if you’re sure the latest one works fine for you. After the update 8 Cinnamon does not work. I installed before mint-meta-debian-cinnamonand followed the instructions. If starting DE Cinnamon says it’s crashed, asks to reboot Cinnamon but it is a continuous loop. It says the problem is fixed in version 2:9.4.0-1280544-1, which is in Debian Testing repos. Can you get it from there and test if dkms module compiles fine? When I pressed installed I had the following warning? Is it normal? Tish is your last opportunity to look through the list of marked changes before they are applied. You are about to install software that can’t be authenticated. Doing this could allow a malicious individual to damage or take control of your system. Will UP8 upgrade the linux kernel used in LMDE? Monsta, well today an official repo is very busy, so I’ll try tomorrow. I have a question here which is still under moderation. Please look at it. What do you think? Is it somehow related to hardware configuration? Thanks guys, everything seems going OK after the update to SP8. It was a huge SP and the system seems to work smoothly. While updating sources, error messages pop up. It shows “duplicate sources.list found…” in several lines. What can I do? I got a small problem. When trying to upgrade the update manager tells me to repair broken packages. Taking a look into synaptics the repair packages button doesn’t do anything (an apt-get -f install does nothing as well). Any idea what I need to fix? Hello there, sorry to bother you. What i did was i saw updates on the mint update thingy, and immediately i used the terminal and did sudo apt-get update and sudo apt-get upgrade. But i had not updated my sources list as mentioned here. INstead the below following were and are the repos i had in my /etc/apt/sources.list. @Muntasim-Ul-Haque: you can read the UP notes to find the answer. @dbzix: I don’t see that other question, it’s probably still under moderation. Why don’t you post it at the forums? They’re far more convenient for answering questions and solving the problems. After upgrading to the 8th package the cinnamon not apply theme (icons, window decoration) if the system has more than one keyboard layout. 1. I’m missing the “keyboard” entry in Preferences. Can’t find it anywhere. I can change layout in system settings, but shortcuts can’t be defined in that panel (regional settings). Don’t know how to do that from the console (btw which file would I have to edit?). As my configuration got overwritten during update (or myself?) there are some default shortcuts that conflict with my emacs settings… (Alt-Space for example – a hint on how to specifically disable that shortcut would also resolve my problem). 2. Is there a way to disable login sound? Nothing past logon screen, blank, for multiple desktops, mate lxde gnome …., cl okay. Read helpful posts, installed plymouth (missing), purged hal, and installed mdm (missing) and all fixed. I’ve never been totally happy with GDM3. I’ve had problems on other systems with it. why gstreamer failed to download when i upgrade to Up8? how to solve this problem. when i wont to update to UP8 show this: first need to fix a corrupt packets. What i wanted to knowk is if i have caused any irreparable harm by doing the above? I accidentally removed my kernel on update… I tried restore it by chroot, even recompiling a new kernel in it but no luck.. My remaster just couldn’t install properly so, I reinstall last distro and re-upgrade it. Fortunately I kept a backup from my home dir so I just lost some more time reinstalling my apps. The system now seems stable and fast. Looking forward for the updated iso. I’m using LMDE 64bit MATE as my primary system for professional purposes (programming-development of web apps). Update from UP7 to UP8 via update manager appeared to go well. After reboot get login display. However, attempt to login leads to a blank background (same color as login screen) but then nothing. Same with MATE, Cinnamon, Gnome. Sometimes the blank screen will go back to the login screen. Checked sources.list, redid apt-get update and apt-get upgrade and it reports everything up to date. Verified all the mint-meta-debian packages are installed. Any help? Thanks. Seems my login problem is problem with gdm3. Installed mdm and mint-mdm-themes. Now login works. Tried going back to gdm3, still broken. So will be using mdm. Want to thank one more time the guys who help (and especially Monsta) and the LMDE team who worked hard for all of us on this great distribution! Great work – thanks a lot! Now everything is working even better than before. i hope i’ll actually be able to install next lmde. the current one behave differently with every attempt that i’ve made to install it and it keeps freezing at diffrent parts of installation routine. – cinnamon-settings-daemon crashing when more than one keyboard layout is defined (workaround, only keep one keyboard layout for the time being). – nm-applet missing at launch in cinnamon-session (workaround, run nm-applet manually). Hello there, sorry to bother you. In the update manager i saw updates and UP8. What i immediately did was i used the terminal and did sudo apt-get update and sudo apt-get upgrade. But i had not updated my sources list as mentioned on this page here. INstead the below following were and are the repos i had in my /etc/apt/sources.list. What i wanted to know is if i have caused any irreparable harm by doing the above mentioned? Edit by Clem: For a few hours packages.linuxmint.com was updated to UP8 whereas RTS wasn’t. Right now they’re both up to date though, so if you’ve no more updates coming up, I’d assume everything is fine. After update on Virtul Box are have deleted partition table of vdi image. It is very stupid error. This solution is not possible http://veino.com/blog/?p=1019 becouse list of partitions is empty. Are you install this update in Virtual Box LMDE vdi disk? When I install it,my vdi image is destructed. Is it only my problem? So, it’s just missing icon in Mint-X icon theme?.. Temporary fixed by switching to Gnome (default) icon theme……. @Roman Y.: you can run dmesg to see the exact message about segfault (if it was segfault, of course). Also something might be found in ~/.xsession-errors file. If you find something interesting I suggest posting it at the forums instead of here. I had to reinstall LMDE as I didn’t disable the Nvidia driver. I then updated to UP8 with no problems using the nouveau driver. I’ve tried with several mirrors. Thank you for a nice and very important update. After two years of work, Cinnamon goes its own way and can look forward with pride. ?? I did it and it did no harm. As far as UP8 is concerned, everything important is OK. Some system messages (like the one for starting Synaptic) and the weather applet are still in English while I set “French” for all my language preferences. Small thing. After upgrading to UP8 (Cinnamon edition) no icons, themes or decorations were applied. I checked the Appearance menu and here Icons and Window borders are both set to Mint-X. Even after changing the Mint-X value to another one – nothing happens. Is there anyone who already solved this issue ? I’m back with a major problem after update: caja halts on user mode, I can only run it in root mode (sudo caja). etc, but it doensn’t seems to fix. Thank you for your reply Clem. There are updates/upgrades being shown in the update manager as well as synaptic right now. However I did a sudo apt-get update and subsequent sudo apt-get upgrade and still there seems to be no more updates/upgrades in the terminal while updates are being shown in the update manager as well as synaptic. And when i checked my libreoffice for confirmation, the installed version is 4.0.3.3 while the latest is 4.1 something in synaptic. My question is if i can’t install updates/upgrade using sudo apt-get update and sudo apt-get upgrade what do i do? Can i use sudo apt-get install or is it more dangerous under the above mentioned circumstances? 2. I am very sorry to be such a bother; I am not actually as Linux savvy as I should be. 3. Should i be posting the above in the forums instead? I had problems with Locale too, I use English language in Sweden so I need the correct paper size etc. After UP8 the locale had changed to ‘C’, seemingly US English defaults. The settings in Control Center/Regional Settings/Formats tab are borked, nothing is selectable and I can’t do a thing. The other tabs seem correct. E: Release file for http://debian.linuxmint.com/latest/dists/testing/InRelease is expired (invalid since 53d 7h 19min 2s). Updates for this repository will not be applied. given that nobody else gets this error – what do i wrong? but this is against the idea of safe repositories and keys? Two days ago I have deleted my LMDE – the system sometimes was gone down. Hope, that this update pack will bring more stability to LMDE. And now I am waiting for iso – don’t want to update it, to prevent appearing of errors. @Monsta: Yes FF 25 works very stable, but 26 and 27 not 🙁 After the UP8 iso’s are out i test it on another computer to be sure it’s not a system problem. Hi, What does the following mean? I don’t see any green color in “Your system configuration”. Thanks! Reinstalled mint-x-icons and mint-elementary icons by apt install –reinstall. Now dialogs, gedit, dconf-editor, etc – all working!.. I just updated my computer to Update Pack 8, and am mostly happy with it. I’m using the cinnamon version and did “apt install mint-meta-debian-cinnamon” before running the update, as the Update Pack info suggested. I got some errors at the end of the update, but as far as I can see they relate to vlc (and probably some codecs that vlc can’t use). Everything I tried works fine. The only thing that bugs me (a bit) is that I have a black screen background and no way of changing that. At the end of the update I had a black screen with the window(s) of the update manager (update still running) and the taskbar. I opened nemo, looked at my desktop (in nemo) and suddenly everything on my desktop was visible again. But since then I have a black desktop background. Right-clicking the desktop and trying to change the background image did nothing, as did choosing a different color for the background (in the same window, under advanced). Update to UP8 went smooth with no errors, thanks for that! – GDM3 workes out of the box. BUT: energy management ignores its settings since this update. When I close the laptop lid, nothing happens, but it should suspend (energy save) as I declared in energy management. I also declared suspend on power-button, but it shuts down instead. the mate-control-center is installed correctly, like before, but it simply ignores these settings now. Ah yes, and I can find no place to configure gdm … where can I choose different themes? Has someone of you out there problems with UP8 + google-talk-plugin + FF26/FF27/Chrome? I cannot start a video chat anymore! After the update, #linuxmint-debian was removed and XChat logged in into #linuxmint-chat and #linuxmint-help, as the Ubuntu-based edition would do. @acrophoenix: you should see a green icon with letter “i” inside and a message that says “Your system is pointing to the Linux Mint Debian Latest repository”. If there is something else, it’s not safe to upgrade and you need to fix the issue first. I am wondering what the problem is with my post from yesterday, as it is still ‘awaiting moderation’ after 24 hours? It is a genuine problem with LMDE following installation of UP8. I assume something which was listed as ‘obsolete’ is actually needed by mintsources. Following update, I have no desktop background and can’t set one. The images are there in the library, but they don’t “take.” There are also some error messages on booting. Since updating LMDE (Mate) to UP8, I have been unable to reset my monitor screen resolution using the control panel or via the preferences in the menu. I want to decrease it from 1600×1200 to 1024×768. I’ve tried setting it, hit “apply” and get a blank screen for about 30 sec before it returns to the 1600×1200 resolution. Also tried making 1024×768 the default setting and that doesn’t work either. Help, pleae. Did a FDE install of 201303 LMDE MATE X64 and then upgraded to UP8. Install went smoothly and download/upgrade of 1500+ packages went surprisingly fast. Only a couple of minor issues so far. Luks unlock box is positioned right over the LM logo but that does not hamper unlocking the encrypted volume. Also there is about a minute delay when shutting down. I have not investigated that yet though but I suspect it probably has to do with an NFS4 share I have. And then there’s the usual /etc/fonts/conf.d/53-monospace-lcd-filter.conf situation where 2 fonts are listed and one needs to be eliminated. Other than that, so far so good. I have a switch that allows me to choose up to four hard drives. I back up with clonezilla directly from one drive to another. Then I update. Every thing went fine . . .as usual. Only thing is I have to update HPLIP print driver every time . . no big deal. I love these rolling releases . . .hate to have to reinstall everything, I am surprised that PClinuxOS is the only other release out there for for people with modest computer skills like me. I’ve tried them both and prefer Mint LMDE. Clem . . live long and prosper. The bug of closing the lid (as described above) only affects MATE, not Cinnamon, I found out! Also, most settings of the Energy Management work instantly (like dim background on battery). The only two functions not working are what he shall do on lid close and on power button press. Lid Close does nothing, no matter what you choose. Power Button always shuts down no matter what you choose. Maybe a hint for finding the bug: when you choose “ask me what to do on power button”, he asks me what to do AND still shuts down 🙂 Maybe there are two drivers installed that react to the same event!? In System Settings>Regional Settings>Formats I could not select a region because there are no regions to select. In the Languages tab I have eight languages, but nothing happens when clicking “get more languages”. Clicking the +-signs shows an empty square. @Monsta: Thank you, I do see the information “Your system is pointing to the Linux Mint Debian Latest repository”, but it is not a green icon, it is yellowish, and there is no letter “i” inside. Last time when I upgrade from UP6 to UP7, it is also like this, and I upgraded with no problem. So I suppose it is fine? @Monsta: Ahhh… I see, it is because of the icon theme I am using. So it is green only if you are using the Mint theme. I think you should change the wording in the instructions, so that it is not confusing for people using a different icon theme. – Gdebi package manager: it’s not able to (apparently) finish the installation of packages. – I have noticed (with Banshee at least) that when I start this software the volume becomes suddenly 100%. For the latter I’ve found a workaround in the solydxk forum, editing /etc/pulse/daemon.conf. This breaks Google Chrome. But you should be able to fix it by unistall/reinstall it again. When will the ISO be available??? I’ve had issues with the update (if a bug in UP7 still applies in UP8 it should be listed under UP8 as well). After screwing everything up trying to fix things, I ended up reinstalling from the ISO (UP6) and doing a dist-upgrade to get to UP8. When booting UP8 for the first time, I was met with a blank screen. Adjusting grub’s options to use “i1915.modeset=1 driver intel” and “nosplash” let me boot into a graphical environment. Then I used the Device Driver Manager to switch to nvidia drivers and that fixed the blank screen issue. I’m currently having a locale issue similar to Ced and maurOS. Worse, all the locale settings are set to my password in plaintext! Are there any fixes for this yet? This is a HUGE security breach on my machine. “dpkg-reconfigure locales” didn’t work. There shouldn’t be a problem with doing a fresh installation and fully replacing the home directory with a backup I made, correct? Looking forward for the updated ISO. Thanks for your work. Since I applied the LMDE (Mate) Update Pack 8, I cannot reset my screen resolution. It stays at 1600×1220. I prefer it at 1024×768. When I set it using either the control panel or preferences and apply, I get a 30 sec blank screen and then a return to the same settings (I’ve tried making it Default, but that doesn’t change the resolution. Help, please. thanks for this new Upadate Pack, I was looking forward having sticky windows on cinnamon. After update I can’t suspend my Workstation, it says that I don’t have permission to do that action. Could I do something to fix it? My starting point was to have installed LMDE 201303 a month ago, then UP7 and now UP8. the new version of Evince is really faster and nicer than the previous! excellent! Upgrade went fine. Thank you Mint Team and our giant Debian brothers on whose shoulders we’ve been standing. Mint Team, you are adding a lot of easiness, beauty, friendliness and functionality to Debian! Warm regards from Greece. Thanks for the update. It went smoothly. All questions were answered in the @linuxmint-debian chat channel promptly and kindly. Appreciate the hard work by all. So happy for the update. Thanks. Need to get 0 B/27.5 MB of archives. After this operation, 86.8 MB of additional disk space will be used. Selecting previously unselected package acroread-l10n-en. Selecting previously unselected package acroread-debian-files. Selecting previously unselected package acroread-data. Selecting previously unselected package acroread. Selecting previously unselected package acroread-dictionary-en. ERROR: ld.so: object ‘libesets_pac.so’ from /etc/ld.so.preload cannot be preloaded: ignored. Now, admittedly, I am rocking a 64-bit system and the package is 32-bit & I am a novice linux user of only a few years…but here is what I know: before UP8 in worked and now nothing using the “libGL.so.1” library works. I know this because I tried a different pdf viewer to get around using acroread….but I got the same error output because it needed the same defunct library. Any help anyone can give me will be appreciated. But please, in advance, do not tell me to just use Evince….I need a pdf reader that will unlock Vitrium-locked pdf’s via contacting my school server w/ my log-in info…..until my upgrade to UP8 this was possible using the SLOW but usable acroread. Please help. Flawless upgrade from 7 to 8 on my Toshiba Satellite. Thanks Clem and your team for doing such a great job. If only the general public would wake up and see what you have to offer here. I promote and distribute Linux Mint as much as a I can. I noticed that this update will remove texlive. Did cinnamon break something with tex distributions that they will no longer work? Update went fine – I really like the new login site, only ‘libre office’ is now a little unstable – sometimes it crashes caja and the panels are invisible but not gone(klickable).But I need more time to check this. i recently downloaded LMDE iso using torrent link. but it seems it is not up to date. it is showing me about 808 MB updates!!! please update the iso file. Mintupdate did not manage to start the upgrade process for me. Manually issue sudo apt-get dist-upgrade seems to work at least so far though. When clicking install packages in Mintupdate it just restarts, updates the list and that it it. The last install iso was 201303. When is the next one due to be relsed? I need to completely re-install LMDE and if an update iso is due to be released soon, will wait. I was using Mint XFCE but i wanted to go with a debian version. Thank´s for UP8​​, went without any problems here. Does it take long until the LMDE iso files updated with UP8? I’m so happy with UP8! All my hardware is finally supported, and it’s noticeably faster than the Ubuntu base. Not to sound like a broken record, but can we get an ETA on that ISO? Hi, I update my system successfully and now (after update) I have a small problem. If my screen i locked from screensaver, sometimes (but not always) cursor does not appear in password field (even if you click on it) and is impossible to unlock my system. the only way is to kill X server Ctrl-Alt + F12 and start it again. I had not this problem before the update. An other problem is with SMB mounts with gvfs most of times they freeze during the transfer, but i had this problem and before update. all others Works perfect for me. I have been meaning to try LMDE but all I have is an old Mint LMDE iso from 12/12/13. Will the update pack 8 work with that or should I download LMDE again? Hi i just noticed that if i open system settings and then account details webcam turns on automatically for few seconds. Is this right or is a bug? when will be ISO UP8? Found 1 minor bug. The GTK spinner widget (https://python-gtk-3-tutorial.readthedocs.org/en/latest/spinner.html#spinner-objects) doesn’t spin in the Mint-X-theme, while it does spin in every other built-in theme. Any update on when to expect the new ISOs. I am not getting the top most layer of my windows where the close, minimize and maximize button are suppose to be. My desktop background has gone black plz help. @ Andrea: yeah, that has been happening since UP6 at least on my pc. @Jürgen Kazmirzak: thanks, reported this issue on github. I do now a completely new installation the 4. time because update didn’t everytime not work 100%. Only 0-90%. My main problems seem to be with the display driver for nvidia. After installed update pack 8 last time and more or less working I wanted to change in drivers menue to the origin nvidia driver. It told me that was everything ok and I should restart computer now. That was it again. “Can not start xserver”. Also no cinnamon was missed every time and I had to install it afterwards manually. Klaus, did you check if you must use legacy driver version 304xx for Nvidia ? If your GPU isn’t so new, you MUST use it, or won’t work at all with “current” version. @Klaus: if you used DDM for installing NVidia drivers then it’s no wonder this happened. DDM was buggy and horribly outdated, and it’s been decided to remove it from the repo. Now it’s no more. Thanks a lot, LMDE team! My MATE edition updated smoothly without any problems. But there is a very small bug. When I logout, the login screen is without any theme and is a little ugly although I have chosen a specific login theme. I updated to the latest version UP. Really anxious for the new ISO, because i intend to install mint Debian on all my systems and those of friends and family. Untill now there always was some flaw in the debian branch, but the last 2 updates have been really awesome and stable. My parents still run mint 14, my neighnour mint 15 and my girlfriend mint 16. With the new ISO i’ll upgrade them all to mint debian LMDE. That way i just have to update the systems instead of reinstalling everything over and over again. But Clem, thx lots and lots for all your efforts. Linux Mint is the system i love. And i tried lots of them. Mint has it all ! First time ever, went sithout a hitch. Even the Nvidia drivers where ok. good work. Edit by Clem: As soon as they’re ready 🙂 Look, the only reason we hold them back is because there are bugs we want to fix, so the more you wait the more stable they get. We don’t set dates in the calendar and release no matter what. They’ll come out as soon as we’re happy with them. 0 packages upgraded, 0 newly installed, 2 reinstalled, 0 to remove and 0 not upgraded. Need to get 0 B/266 kB of archives. After unpacking 0 B will be used. So I am at a loss. Has there been anyone who has installed acroread on LMDE UP8? Do I need to just backup my system, wipe it, and re-install LMDE when the ISO drops? Again, respectfully, thank you and anyone willing to advise and help me. @kevin: I can’t reproduce it, acroread runs fine one my system, it finds all the libs… I suggest posting this issue at the forums. These comments are not convenient for discussion and they’ll be closed next Tuesday anyway. I read the “Update Pack Info”, and removed afterwards the “Gnome packages no longer required by Cinnamon”. When removing ‘gnome-session-bin’ synaptic also wanted to remove mint-meta-debian-cinnamon and nemo-share, so I did it. Then afterwards I tried to re-install mint-meta-debian-cinnamon and nemo-share, but synaptic said there were failed dependencies. Then I installed them via ‘aptitude’, and it installed again ‘gnome-session-bin’. ‘mint-meta-debian-cinnamon’ depends on ‘nemo-share’ which depends on ‘gnome-session-bin’. I did the UP8 pack this morning. Besides the HAL warnings, my panel is gone, replaced by a completely empty panel. I can’t add anything to it either. I’ve left with no mint menu, no notifications, and no way to start applications other than a shortcut to the run-dialog. Anyone know what I can do about the panel. I’ve tried adding to the existing panel and “new panel”, both of which does nothing. installed mint-meta-debian-mate and the panel came back after reboot. Another issue I’ve noticed. On my Thinkpad (X60), the thinkpad Suspend doesn’t work anymore. It just screen-locks. Suspend from the menu works. Hibernation stopped working for me as well. I can’t resume successfully from it. I noticed that after UP8, apt-get wants to autoremove a bunch of mate stuff. My primary and only desktop is mate. I fear that if I let it “auto remove”, I’ll be left with a system that won’t be useable. But after the update, ptp devices don’t automount anymore. gphoto2 is there, gvfs-backends is there, mtp automount correctly but no luck for ptp. Does anyone else have the issue? I notice that my systems are running quieter, cooler and feel my zippy with UP8. I should have taken some benchmarks of UP7 vs UP8. Seeing the difference on multiple systems. Flawless upgrade. Excellent work by Clem and team in preparing update pack 8 after intense testing to make sure nothing breaks. Just a small bug related to hal which had to be removed to go away.